Theresa May Reminds U.K. Citizens That State Owns Their Children-Fiction! - Truth or Fiction? British Prime Minister Theresa May reminds U.K. citizens that the “all-powerful state” actually owns their children. A website that publishes “Christian news satire” is behind false rumors that Theresa May issued a reminder to U.K. citizens that the state owns their children. The article appeared at The Babylon Bee on April 24. It likely references the story of 23-month-old Alfie Evans, which sparked worldwide outcry. The toddler, who had been in a “semi-vegetative” state, was removed from life support against the will of his parents. Alfie Evans’ condition reportedly remained stable, and his parents said on April 26th that they’ll take the boy home. May was criticized for remaining silent on the issue. 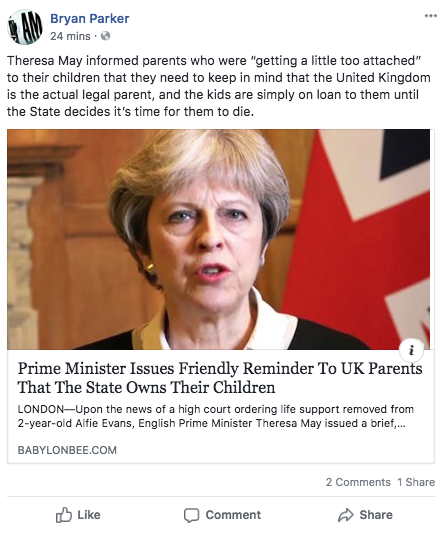 A satirical report that Theresa May reminded U.K. citizens that the state owns their children have been take out of context on social media. Red Cross Spends 92 Cents of Every Dollar on Salaries-Fiction!